How often does a quake occur in Japan and why is the nation so prone to them? Including those too small for people to feel, there are more than 100,000 earthquakes every year in Japan and surrounding areas, according to the Seismology Society of Japan. Of those, 1,000 to 1,500 exceed 1 on the 7-level Japanese seismic intensity scale, meaning they are strong enough for people to notice. In terms of the open-ended magnitude scale, records show that over the past century there has been an average of one magnitude-7 or greater quake almost every year. There are about a dozen major tectonic plates covering the Earth like “the surface of a soccer ball,” said Ryohei Morimoto, an honorary member of the Association for Earthquake Disaster Prevention and a retired professor of volcanology at the University of Tokyo. Each tectonic plate is approximately 100 km thick and moves with the mantle and magma below a few centimeters every year. Japan is jolted by the collision and slippage of four major tectonic plates under its surface. What are the major recent earthquakes? In July 1993, a magnitude-7.8 temblor hit Hokkaido’s Okushiri Island, causing a tsunami that wiped out its fishing village. The death toll reached 201. The most devastating earthquake in recent history was the magnitude-7.2 quake that struck the Hanshin region around Kobe in 1995. The Great Hanshin Earthquake resulted in the loss of 6,434 lives and left 43,792 people injured. About 104,000 houses and buildings were completely destroyed. 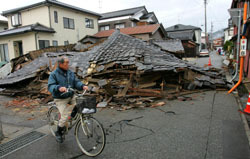 On March 25, a magnitude-6.9 quake hit Ishikawa Prefecture, killing one and injuring 279. The last strong quake occurred April 15 in Mie Prefecture. The magnitude-5.4 quake injured 12. What are the chances Tokyo will be hit by a major earthquake in the near future? 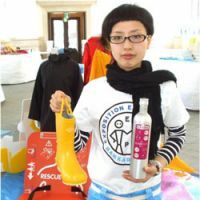 In 2005, the Cabinet Office’s Central Disaster Prevention Council calculated a 30 percent chance of a massive earthquake in Tokyo within the next decade and a 70 percent chance within the next 30 years. Since the 17th century, two magnitude-8 level earthquakes have struck Tokyo: one in 1703 and the other in 1923. Experts believe massive temblors take place every 200 to 300 years. Records also show that between the two colossal disasters, there were three smaller but destructive magnitude-7 earthquakes, in 1782, 1855 and 1894. Based on the fact that 84 years of seismic pressure has accumulated since 1923, the government predicts that a major earthquake is imminent in Tokyo. Other areas in Japan expected to be hit with major temblors in the near future include Shizuoka, Aichi and Mie prefectures. According to the council, 850,000 houses and buildings would collapse or burn down if a magnitude-7.3 quake were to hit the northern area of Tokyo Bay. Depending on the timing of the quake, the consequent shutdown of transportation services could strand an estimated 6.5 million workers. It is also estimated that such a quake would kill some 11,000 people and injure 160,000. What was the biggest earthquake ever? A magnitude-7.9 earthquake struck the Kanto region Sept. 1, 1923. More than 105,000 people lost their lives in the quake and subsequent fires. In 1960, the government established Sept. 1 as a day of disaster prevention in remembrance of the Great Kanto Earthquake. The biggest quake on record struck in Chile on May 22, 1960. The magnitude-9.5 quake killed 1,743 people. A series of tsunami caused by the earthquake crossed the Pacific, reaching Japan 22 hours later and killing 142 people along the coast. According to the U.S. Geological Survey, the deadliest quake on record occurred in Shaanxi, China, in 1556. As many as 830,000 were killed in the magnitude-8 quake. Yes, but only in a limited fashion. Since 2004, the Meteorological Agency has been keeping track of changes in small shock waves to foretell a serious temblor. In 2005, the system warned of an earthquake, which registered 5 on the Japanese intensity scale, in Miyagi Prefecture 16 seconds before the major shaking began. Last August, the agency began providing the warning service to electricity, gas and railway companies as well as hospitals. 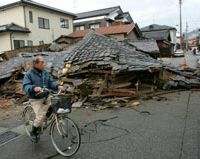 In the case of the Ishikawa earthquake in March, the agency issued a warning to the town of Noto 5 seconds before the major quake hit the area. If it determines the system will not cause widespread panic, the agency plans to provide the emergency warning system to the public later this year. The use of catfish, which are believed to sense tiny tremors, as a warning system has been studied since 1978. Studies by the Fisheries Experiment Station of the Tokyo Metropolitan Government showed that catfish are extremely sensitive to electric waves and react to the release of faint underground stimuli before a quake. In the 12 years of research, catfish responded unusually prior to 27 of the 87 quakes greater than 3 on the Japanese scale, or approximately 31 percent of the cases, that took place in Tokyo. How can we prepare for a big earthquake? Under the Disaster Measure Basic Law, the central and local governments are required to stock emergency supplies, including water, food and blankets. Overall, there are approximately 16 million emergency meals stockpiled in Tokyo, according to the metropolitan government. It urges residents of buildings constructed prior to the revision of the Building Standard Law in 1981 to check their buildings’ quake resistance level, because until then buildings were not required to withstand an earthquake of upper 6 or greater on the Japanese scale. Residents are also urged to stockpile the most up-to-date emergency supplies. 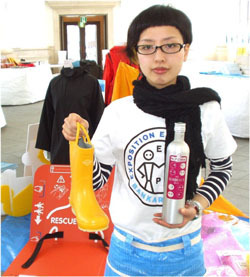 Among the supplies on display at the Earthquake Expo in Yokohama, which opened this month and runs through May 6, are shirt buttons that double as emergency whistles, and freeze-dried tissues the size of a coin that expand to regular wet tissues when dipped in water.